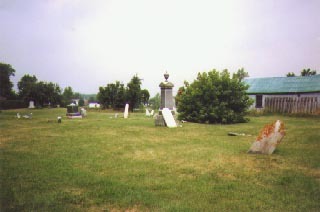 THIS Cemetery is about 150 by 150 feet and is surrounded on three sides by houses, which are facing the streets Chemin Du Fleuve and Rue Du Fort. It is opposite the grounds of the FORT COTEAU DU LAC on the west side. When we visited this cemetery in late June 1985 to re check the inscriptions, it was a hay field and some of the edges, on all sides being cut. During this visit we found 31 stones with readable inscriptions, 2 less than when it was first copied three or four years earlier. it is an abandoned cemetery, probably Anglican or maybe baptist, but we are not sure. George West 1882 - 1946, beloved husband of Clara Andersen 1881 - 1983. Julius Andersen 1855 - 1945 his wife Clara Parr 1858 - 1946. Edith Coleman 1881 - 1944 wife of George Young. Sacred to the memory of George Eagles a native of England who died 28 July 1855 aged 35 years. As a token of esteem, his fellow workmen have erected this stone to his memory. In memory of Norman Bell died Feb 9, 1904 age 5 days. In memory of William Eric Wade born & died Feb 26, 1904. In memory of Sarah Cooper native of Sheffield England and wife of Joseph Class Cowley. She died on her husbands farm at Bisson Point in the parish of St. Clement and was buried here Sept 6 1867. And in Memory of Joseph Class Cowley husband of Sarah Cooper also a native of Sheffield England, he died on his farm ___________ and was buried here Aug 28, 188_. In memory of John Reay born July 14th 1833 died Jan, 7th 1912. Mary Reay born June 5th 1845 died April 4, 1915, also William Reay born June 5th 1831 died July 27th 1901 interred at Drummonville, Quebec. Robert Reay Interred at Pheonix Arizona U.S.A. Children of Joseph & Janet Reay . In memory of Joseph Reay born 17 March 1800 died 26 Jan 1859 his wife Janet Mary Yarker born 6 Sept 1805 died 26 Mar 1880. Natives of England. Also their 4 children. Maria died 31 July 1836 or 56? Mathew died 15 June 1870 or 40? Robert died 16 Dec 1871 or 41? James died 22 Dec 1871 or 41? In memory of John Ewart of Cumberland England died Aug 13th 1890 aged 84 years. Also his beloved. wife Sarah Boston (of Quebec city) died Dec'r 10th 1862 age 56 yrs. In memory of Sarah J. Ewart wife of John Hazlett died March 5 1879 age 29 years. To weeping friends left behind. Pure angels love to share. Johnson Briggs entered into rest January 2nd 1879 aged 60 yrs. For as in Adam all die even so in Christ shall all be made alive"
Erected by Mrs. Eliza McPherson to the memory of her father Robert McIntyre who died Mar. 18, 1871 ae. 83 yrs 1 mos 18 days. Sally wife of Rufus Hosmer died Mar 24 1871 aged 92 yrs & 3 mos. Davis Grange born Aug 1, 1790 died Oct. 1, 1858. Rebecca Odlam wife of Davis Grange born Sept 23, 1789 died Mar. 18, 1873 aged 84 yrs 6 mos. Mary Ann Scott widow of the late John Grange and wife of Thomas Grange died Dec'r 12th 1878 ae. 57 Yrs 10 mo's. Eliza Grange wife of Mathew Briggs born June 10th 1826 died Dec 10 1860 age 34 yr's 6 mo's. William Henry Grange born Aug. 4. 1832 died Mar. 4, 1867 ae 35 Y's 7 mo's. Sacred to the memory of Jane Clarke, daughter of William Clarke and Felicit his wife who departed this life on the 15th day of October 1832 aged 44 years ?? Georgiana Perry beloved wife of Cha's 0. Pease, who died Feb 16, 1875 ae 34 years . 20 Lucy Ann Pease wife of W. G. Perry died Apr 30,1864 age 26 yrs. Lucy Ann Pease wife of W. G. Perry 1837 -1864. Edmund Chard Pease 1851 - 1898. Lydia Adelaide Pease 1846 -1899. Asael Josiah Pease 1830 - 1831. Delia Eliza Pease 1840 - 1841. Daniel Albert Pease 1849 - 1852. Anna Maria Pease wife of Chas McLean 1832 - 1857. Orton Pease born Mar 30 1808 died June 17, 1892. Mary Hare wife of Orton Pease born Dec 10 1815 died Aug 9, 1884. Sacred to the memory of Mary Hare beloved wife of Orton Pease born Dec 10 1814 died 9 Aug 1884 age 69 years 8 months. In loving memory of little Walter Farris born Oct 9th 1891 died July 9th 1894 age 2 yrs & 9 mos. In memory of John Edward died Mar 22, 1847 age 6 mos22 days. Charles Arthur Westley died Oct 20 1856 aged 12 years 5 mo's 8 dy's. Henrietta died Feb ___1859 aged 8 yrs 3 mos 29 days. Catherine, Tommy, David, Willie, Ida, Ettie, Ernest, Arthur Children of Charles C. & Sarah E. McFall. Charles C. McFall died Dec'r 20,1878 aged 56 years. Sarah E. Scott his wife died May 14, 1881, aged 52 years, Charles C. McFall their son drowned at Brockville June 30, 1889 aged 35 years. Lydia Ann daughter of John J. & Ann Jane Loy died Feb 26, 1842 ae 4 yrs & 10 mo's. And bud a blossom there. Asahel J. son of Orton & Mary Pease died Feb 2 .1831 ae. 2 mos. also Delia Eliza died July 11, 1841 aet 1 mos. Have joined the heavenly choir. In loving memory of Marianne Roebect died May 16, 1913 also mother and father.